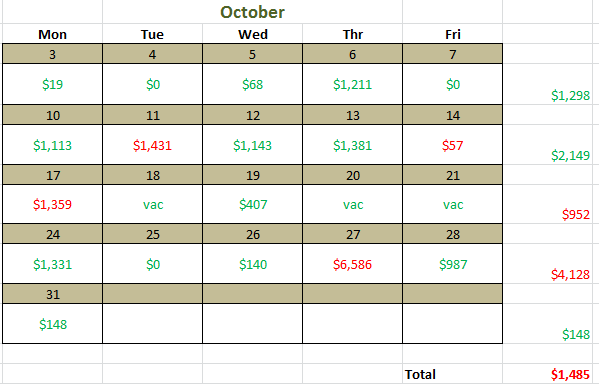 I am ending October with a small loss of -$1,485 and ending my 3 month winning steak as well. The good: My average green day this month was really good… $723. I was able to have the most number of days over $1,000 than I have ever had. I did better this month at adding to some winners. I only had 4 red days. The Bad: I got stubborn on one of my red days, resulting in a $6,586 loss. That single day killed me this month. Had I stopped at my max daily loss # I would have ended this month in the green by over $3,000. I have just two goals for November that I am going to focus all my attention on. 1) Eliminate stubbornness on taking losses! 2) Eliminate trying to force profits. I need to listen to the price action and NOT make decisions based on my P&L. These are my week links and I will work on them until they are eradicated! Sure I am sad that I am ending this month red, however when looking back to the beginning of the year I am incredibly proud of my progress. My consistency has dramatically improved. My number of red days have gone from half the month to no more then 4 or 5 a month over the past 7 months. I am taking bigger positions and having bigger wins. When taking into consideration the data for the entire year I can see improvment. 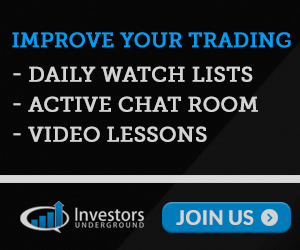 I feel like I am so close to taking my trading to another level and there is one thing that will take me to that next step… overcoming my two current week links! I just know that if I can master my two goals I will start to see more success. For this reason these goals will be my main focus until I have them in check!